In 1980 Madness sung "Baggy Trousers", it sums up my childhood, I remember the great outdoors, playing in the fields, climbing trees and generally having fun. As an 80s kid tech has also ruled my world. I still like the outdoors but as a working adult I often find myself inside. In fact, we typically spend 90% of our time indoors and that influences our health. It's no surprise that standards are emerging in the building management world to address this such as WELL and LEED. I recently attended a smart buildings event. If, like me, you thought Smart Buildings were all about saving energy and costs, think again, that’s just the tip of the iceberg. Smart buildings can also improve health and productivity by looking beyond just how efficiently buildings are operating to how they are really being used. The Stoddart Review found that there is a direct link between a well-designed workplace and impact in productivity. Data is the key in unlocking these productivity gains. If you like data, believe it or not, building management is an exciting place to be right now. Traditionally a pen and paper world, it’s slowly transforming into a digital one. With the ability to put a sensor on anything, it’s now possible to measure everything. I am not just talking static reporting of how many people swiped in on a given day. This is the ability to use real time data to design effective workplaces by looking at how people occupy and use the buildings. From starting the heating and lighting when the first person walks in, to parking the lift on the floor with the most people on it. We can go further and put that data into the hands of the people who are in the building. Our smartphones can be our ID/Access cards, temperature controls and way finders. Imagine walking into a building and knowing which desks are free and where the warmest & coolest zones are. Being able to book a room and find it, or even book a room just by walking into it. If we opt in we can find colleagues with relevant skills sets for that project we are working on. All this occupancy usage data can even change cleaning to a pro-active model by alerting when a room or floor needs cleaning. There are of course so many more use cases, but I think you get the point. 75% of workers will be millennials by 2025 and these guys are used to dealing with data and expect the tech they are using in their personal lives to be readily available in their working lives too. When job hunting they even count the working environment as a critical deciding factor. 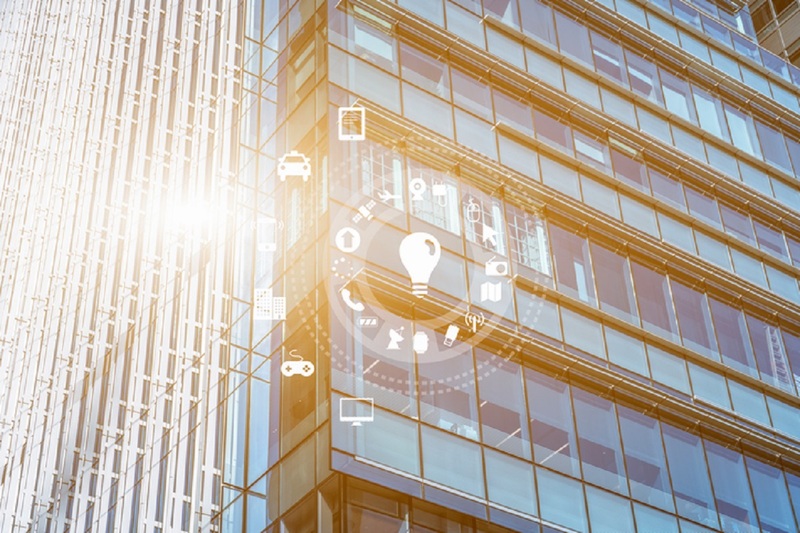 Whether you are owning, managing or just occupying a smart building, it can be a real competitive advantage provided you use the data and put it in the right hands. From owners using the data to gain premium rents by proving reliable operation and health benefits, such as good air quality. To organisations retaining top talent by providing the right environment, with the right tech, that allows productivity to thrive. As our buildings become smarter those who run and use them can become healthy, wealthy and wise. Madness sung "Our House, it's our castle and our keep", Smart buildings are custodians of our wellbeing. And as they become smarter with IoT today, they will become wiser with AI tomorrow. Are you ready for the wise building?